1. Material: Material:100% PU(Polyurethane),Fleece lining,soft and warmth. 2. Closure Type: Zipper closure,windproof hood,can prevent the cold air and keep you warm. 3. Pockets and Reflective stripes: Two bottom pockets in front,with reflective print on back,they are perfect to store things and can also keep your child safe in busy traffic. 4. 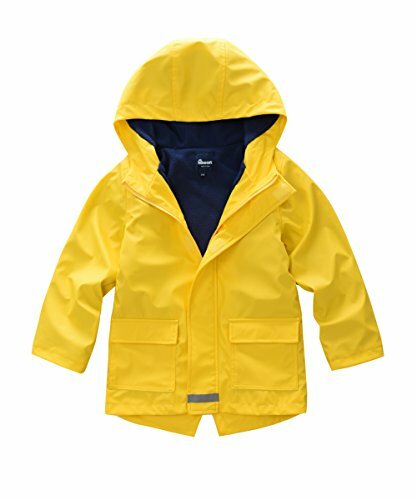 Features: Lightweight,warm and professional waterproof,it is a good choice for outdoor activities.Season:spring&fall. 5. Cleaning tips: If there is only a slight stain, take a wet towel to wipe. Please hang dry in shade, do not exposed. Hand wash. Shell: Waterproof Polyurethane. Lining: Warmth Fleece liner. Keep you dry and comfortable both on the exterior and interior. Double closure type,Velcro snap along with the zipper,can prevent the cold air and keep you warm. The two bottom pockets are deep and convenient for store phone or keys. Safety reflective dot print in back,we care for your children as much as you do. Easy to clean: Just wipe it with a wet cloth. If you have any questions about this product by Hiheart, contact us by completing and submitting the form below. If you are looking for a specif part number, please include it with your message.